Pedro de Atacama: Valle de la Luna at night. 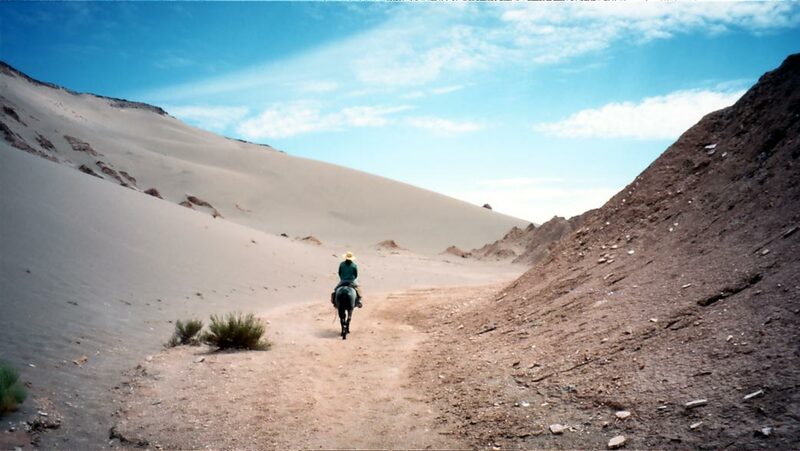 Horse Riding through Valle del Marte / Valle de la Muerte and through sand dessert. 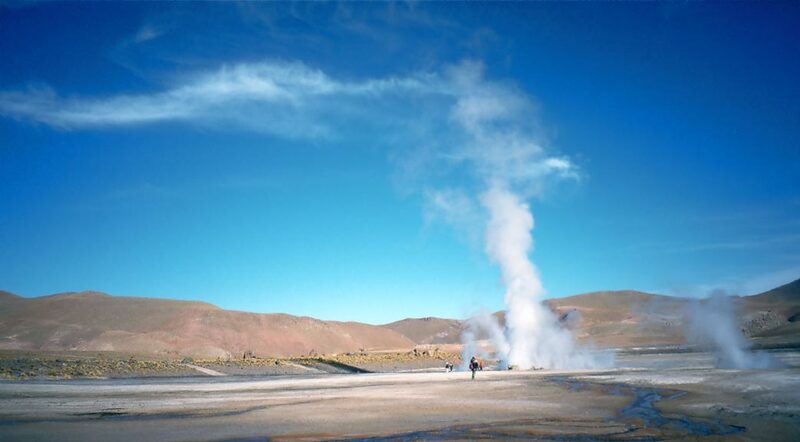 The geysers of El Tatio. After visiting the mine I continued to San Pedro, a pure tourist center in the Atacama dessert. As the region itself is incredible beautiful San Pedro is a must and you have to stand the significantly higher prices and the masses of tourists (though I went there in low season!). On the first evening I had the chance to do a night tour to the Valle de la Luna (moon valley) to see it under the full moon. We were amazed by the strange landscape in strange light, entered caves and climbed some hills. We ended the tour visiting a big sand dune and I couldn’t help rolling me down a bit and then even somersaulting it down. That was quite funny and I believe that you mustn’t miss opportunities like that, but returning home at 1:30 am I had to take a shower and it took me some 24 hours to get the last bit of sand out of my eyes. So I guess once in a lifetime (or maybe decade?) is enough. For the next morning I had scheduled horse riding and we went to Valle de la muerte ( Death Valley ). A part of the guides here say that the valley used to be called Valle del Martes (Mars valley) corresponding to the Moon Valley and the reddish rock formations. But some Spanish learning tourists mixed it up and finally the new name was commonly accepted. The guides in favour of this version say that the other guides desperately try to find explanations for the death-name by inventing stories of dying animals that were transported through the desert to the mines. The other guides deny this totally and argue that the first pictures of the mars surface have reached earth only recently and so nobody knew how mars looks like when the valley got its name. They seem to treat this topic quite sincere. This day I learned something this day: There are at least two different stiles of riding. What I had quite successfully practiced in Tupiza was the English Stile. There is another, the Western American Stile using a different kind of saddle. Trying to ride the English Stile on an American saddle I learned the difference the hard way as some quite sensitive parts of my body got hurt a bit … I guess I prefer the English Stile and will try to practice it soon. Anyway the landscape was gorgeous, rocks and sand dunes and I felt like Lawrence of Arabia. At least kind of. What I saw only increased my desire to visit a real sand dessert as soon as possible. In the afternoon I was so tired that I couldn’t do anything. 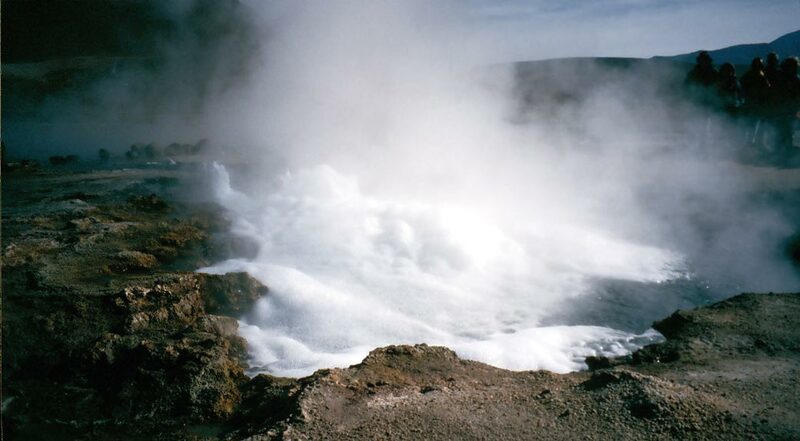 Thursday I got up by half past three and went go the geysers. 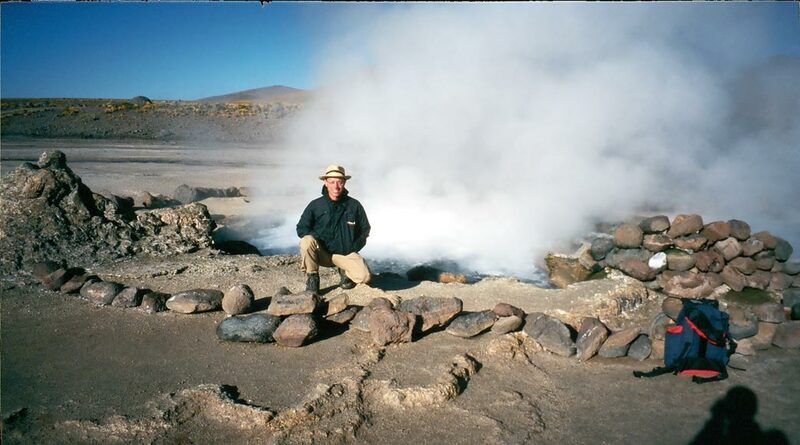 They were quite different to the ones seen on the Uyuni tour; this was not mud but clear, boiling and bubbling water. And it wasn’t as smelly though a little less impressing. But really nice. 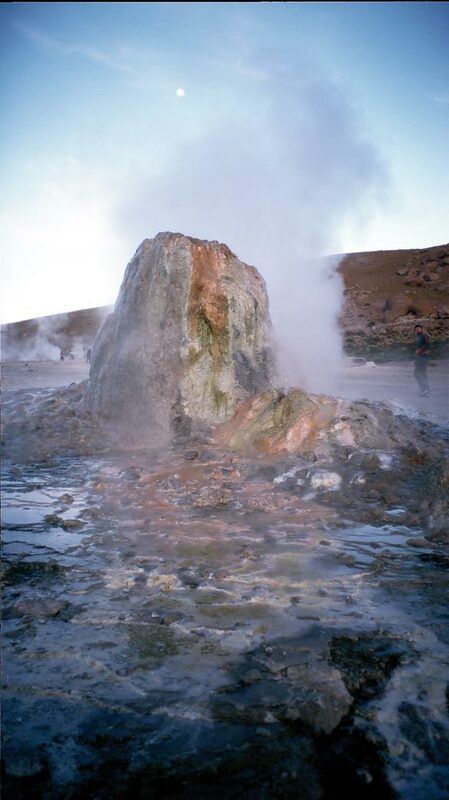 The detail I loved most was breakfast or the hot chocolate served: Our driver / guide had just put the bags in one of the little geysers and soon they were boiling hot. Excellent as it was really cold there. 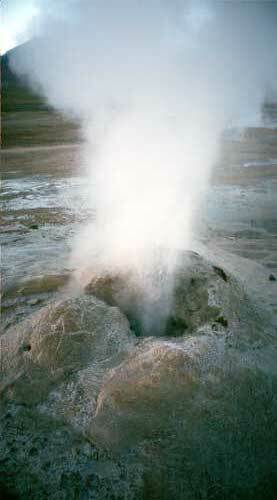 The guides call this geyser “come turistas”, “it eats tourists”. … because they risked everything for a good photo though the dangerous zone is clearly indicated. I would NEVER do something like that. On the way back we visited a little nomads’ village with a very nice little church. 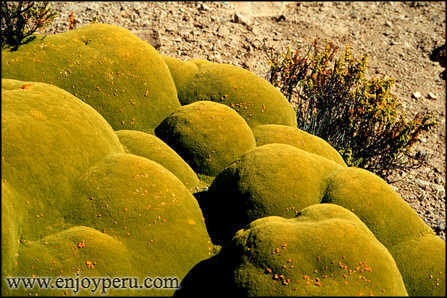 And they showed us a strange plant I had seen before but always considered as a moss covered stone because that’s the way it looks and it is as hard. But it is a plant, the Yareta that only grows one centimeter a year and burns so well that it got nearly extinct as they used it to melt the ore in the mines.